Boilers are in homes; industries and properties across the country, and these important pieces of equipment have safety devices installed in them to make sure that residents and their families can enjoy the practical benefits of hot water on demand without placing themselves at risk. One of these devices is a boiler safety valve. Why are boiler safety valves important? An imbalance of fluid flow caused by the failure of isolation valves. 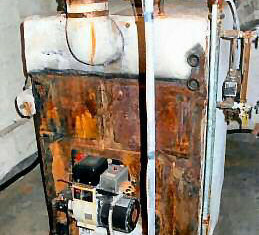 Failure of a cooling system, allowing the water or steam to expand and rupture the boiler. Failure of the control instruments of the boiler. The valve works to relieve the pressure building up inside the boiler. Without this pressure relief, the boiler is at risk of bursting. All boilers are required to have at least one of these valves, depending on the boiler’s capacity. In the USA, only non-assisted safety valves are permitted, and they are located inside the boiler steam drum itself. If the pressure rises above the recommended level for safety, these are automatically open and release excess pressure to take the strain off the boiler drum. Once pressure is back down to safe levels, the valve will reset itself to prevent the pressure dropping too far and wasting energy. This reset mechanism reactivates the safety valve, which will then trigger again if the pressure gets too high. Residential and commercial boilers at wholesale prices in NJ! At Crosstown Plumbing Supply, we can either assist you with choosing a high-efficiency, low maintenance replacement for your boiler or provide you with an extensive range of plumbing supplies to replace necessary parts in your current systems. As we are a wholesaler in a 3.5% sales tax zone, we can make your repairs and services the most affordable in town. Our sales consultants are highly experienced and happy to assist you with finding the right part for your needs and we work closely with reliable, affordable plumbing professionals we are happy to recommend to our clients.